We’d love your help. Let us know what’s wrong with this preview of Dinner With Mugabe by Heidi Holland. To ask other readers questions about Dinner With Mugabe, please sign up. 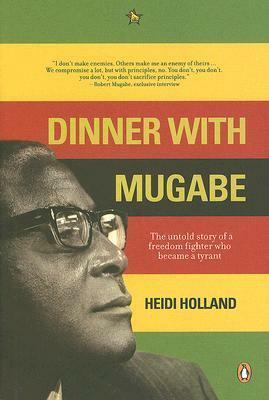 The author, the late Heidi Holland, did not have dinner with Mugabe. But she cooked for him and raced him to his train one night leaving her baby alone. He phoned her next day to see how the baby was. The author was a political journalist and very firmly an enemy of apartheid. She featured him on a magazine cover, that was subsequently banned (but by then it had sold out). The book is about the evolution of the small, clever boy, idolised by his peculiar mother who was a thwarted nun, abandoned b The author, the late Heidi Holland, did not have dinner with Mugabe. But she cooked for him and raced him to his train one night leaving her baby alone. He phoned her next day to see how the baby was. The author was a political journalist and very firmly an enemy of apartheid. She featured him on a magazine cover, that was subsequently banned (but by then it had sold out). The book is about the evolution of the small, clever boy, idolised by his peculiar mother who was a thwarted nun, abandoned by his father and committed to both black independence and Marxism into a brutal dictator who would do anything to stay in power. The more corrupt he gets, the more he believes in his own importance. He grows to interpret the moral base of his crusade in political manner, self-serving to the core. He believes that doing what he wants takes priority over doing what is right. He never sees what he has done as evil but more collateral damage in his war for his country's indepence and growth. A murderer, a man who played with lives like a game of chess, the end justifying the means. A monster. That is how I see it. The author does not agree. She thinks that he is still that lost, small boy inside. The clever child, the favourite, who watched his brother die because of supersitition and got close to no-one but his mother. She thinks that the terrible event of his not being allowed out of prison to go his small son's funeral is a deciding factor in his life. She feels his emotional immaturity and lack of friends directs his life. That he is a man stuck in a small boy's half-understood turmoil and lashing out at opposition now he is in the position of authority. With the author's interpretation, there is the feeling that he is a man, driven into evil. That despite what terrible things he has done, there are reasons and he is to be pityed. The more political the story becomes, moving from Mugabe morally engaged for independence, to one of deep corruption, mass violence, murders, a war... It isn't all fascinating reading though - international diplomacy, or the lack of it can be dry. However, the extensive interviews with the very grand and warm Lady Soames, daughter of Churchill, wife of the last governor of Rhodesia, Sir Christopher who had been close to Mugabe was fascinatingly full of insights into British political life under Margaret Thatcher and Tony Blair. After the international polics, comes the African and domestic variety. Power struggles were not Mugabe's thing. Death, threats, vote-rigging, intimdation and torture were just part and parcel of Mugabe's drive to absolute power . And then the we are at the end and have the author's interpretation of his character with which I do not agree. A summary of the situation to date and that's it. Plenty to think of and reflect on. Honestly, I feel like my views of this book is colored by the fact that I don't know much about Africa/Zimbabwe. While I'm reading books like Dinner with Mugabe to remedy that fact, my lack of (embarrassingly enough) even basic knowledge in many cases made it difficult for me to connect to several of the events that Holland uses to examine Robert Mugabe. The purpose of the book was not so much to describe how Mugabe affected Zimbabwe for the worse (Holland, and probably most others not in ZANU-PF Honestly, I feel like my views of this book is colored by the fact that I don't know much about Africa/Zimbabwe. While I'm reading books like Dinner with Mugabe to remedy that fact, my lack of (embarrassingly enough) even basic knowledge in many cases made it difficult for me to connect to several of the events that Holland uses to examine Robert Mugabe. The purpose of the book was not so much to describe how Mugabe affected Zimbabwe for the worse (Holland, and probably most others not in ZANU-PF, take for granted that he did), but rather to use psychology to examine how it was he made such decisions. Essentially, Holland wonders "[How did:] he squander his life's work, betraying the people who trusted him[?:]. Why? What drove his self-destruction" and, as a result, the destruction of Zimbabwe. She concludes that it was the childhood influences of his mother and the local Jesuit priest believing too much in his future that made it impossible for him to tolerate rejection. Similarly, his awful experiences with the white regime in Rhodesia, especially when he wasn't allowed to go to the funeral of his infant son, made him too angry to resist revenge. (Likewise, what he views as later betrayals by whites in Zimbabwe and by Britain and America fueled that need to seek revenge.) And finally, the effect of those around him kow-towing to his every wish and whim eventually made him "succumb to his power lust as well as to retribution rather than serving Zimbabwe in the best interests of the people who once idolized him" (216). I applaud Holland's efforts in creating this psychological study. I believe that she did a solid job of it--probably as best as one would manage given the circumstances. I also appreciated the re-evaluation of this effect on Zimbabwe in the postscript given the supposed "power-sharing" agreement that was decided upon in September of 2008. I also don't think that she does enough to examine how countries ought to react to similar leaders today and in the future, if as she says the purpose of her book is to make it so we can learn from Mugabe to keep similar tyrants from being shaped and/or coming to power. In the postscript she claims that Britain has a prerogative to speak respectfully (not necessarily appeasing) towards Mugabe to try and broker some kind of relief for his people, which I agree with--diplomacy is the best option nine times out of ten, but beyond that there's nothing. How should we respond to dictators in established dictatorships, like in Myanmar? Or to the newly formed heads of state in younger states? Or what about the variety of tribal chiefdoms in Somalia? A most agonising read for me. Never before have I actually pushed myself to read a book that I admittedly found repulsive at several points. The only pro among so many cons was the actual interviews with key persons in Zim's history and Mugabe's life. That notwithstanding, the reduction of these interviews into superficial and almost nagging "psychological" evaluations (without much significant personal encounters with Mugabe) seemed overbearing to me. It gets to a point where one almost feels l A most agonising read for me. Never before have I actually pushed myself to read a book that I admittedly found repulsive at several points. That notwithstanding, the reduction of these interviews into superficial and almost nagging "psychological" evaluations (without much significant personal encounters with Mugabe) seemed overbearing to me. It gets to a point where one almost feels like the author is "trying too much", over-reaching and insisting on matters that otherwise shouldn't get such a spotlight. And this is why not everyone should be published. This book read like a school kid trying to make a story fit their image. I thought it would be an insightful view of the murderer and despot who has destroyed a country in the name of his gluttony for power, and all I got was some lilly livered person putting across a very shallow piece. Certainly not an author I would want to read anything else by. I found the insights into Mugabe's character fascinating, in particular how dangerous it turned out to be for his Mother and Jesuit teachers to have told him he was chosen by god. But the book didn't flow very well, and I recall losing interest about two thirds of the way through, although I did finish. Not "a book I couldn't put down", but an interesting one nonetheless. Who is Robert Mugabe? How and why did he become the person he now infamously is? These are the questions that Heidi Holland attempts to answer in her book, Dinner With Mugabe. The author bookends this work with the two occasions that she met Robert Mugabe. The first encounter was in 1975, the young Mugabe fresh out of an 11 year stint in jail under the Rhodesian government. She remembers him as well mannered, well spoken and even compassionate. In between her next meeting with Mugabe - in a 2007 i Who is Robert Mugabe? How and why did he become the person he now infamously is? In between her next meeting with Mugabe - in a 2007 interview - much has changed in the country formerly known as Rhodesia. Mugabe has become a seemingly megalomaniac dictator presiding over a country deep in the throes of economic and political crises. What happened? Not so much what happened to Zimbabwe (although that cannot be divorced from the apparent changes in the demeanour, temperament and disposition of its leader), but what happened to the Robert Mugabe of the 70's and 80's? The author interviews a range of people who have known Mugabe at different stages of his life: his brother Donato, the niece of his late wife Sally, Ian Smith, Edgar Tekere, Father Fidelis Mukonori, Clare Short, Dennis Norman, Professor Jonathan Moyo among others. Each provide different insights from about the motivations of Mugabe from their unique vantage point. Holland does a good job of informing the reader of the potential biases that each of her interviewees hold. As usual, the truth about Mugabe probably lies somewhere in the middle. This book, for me, fell short in several respects. Firstly, and most annoyingly, Holland's persistent psycho-analysis feels misplaced and inaccurate. She seems to have already decided that Mugabe's childhood, bookish disposition and inability to form close bonds and traumatic experiences as a prisoner of war are the real reasons behind his aggression toward the West and his inability to compromise. Any evidence suggesting otherwise is dismissed with puerile arguments. Secondly, while Holland (rightfully) exposes some of the potential biases of her subjects, she fails to acknowledge her own. Perhaps her first quick but pleasant encounter with Mugabe in 1975 was not an accurate depiction of the man he already was? Has she hinged too much of her thesis on this one encounter? That said, Dinner With Mugabe is worth reading - albeit with several pinches of salt - for an understanding of Mugabe's reputation within his country and without. In light of recent developments in Zimbabwe, I sincerely hope Robert Mugabe finds time to pen his memoirs so we have his version of events. The real value in this book is in the comprehensive selection of interview material which the author has collected through dedicated research, patience and dogged determination. HH travels between South Africa, Zimbabwe and the UK in the main to interview key people who were either close to Mugabe or close to events which involved the man. The excerpts from interviews with Dennis Norman, Lord and Lady Soames, and Edgar Tekere come to mind as being particularly revelatory to me. There's really qu The real value in this book is in the comprehensive selection of interview material which the author has collected through dedicated research, patience and dogged determination. HH travels between South Africa, Zimbabwe and the UK in the main to interview key people who were either close to Mugabe or close to events which involved the man. The excerpts from interviews with Dennis Norman, Lord and Lady Soames, and Edgar Tekere come to mind as being particularly revelatory to me. There's really quite a lot of interview material to digest let alone opinion. HH's attempts to get under the skin of the man are admirable. She consults a few psychologists and alludes to theories by prominent psychoanalysts like Freud, viz-a-vis personality splitting and repression of emotions. However she does have a tendency to go over the same ground in succeeding chapters. Fortunately this is subordinate to the volume of interview material. I picked this book up from my local library after hearing of Mugabe's awful actions on the news. What better way to understand the man than through the words of those who know him the best? I felt that Heidi Holland wrote this from a biased viewpoint. She thoroughly believes he is not as bad a person as the media makes him out to be, and tries to explain his actions away by using the classic psychological technique of going back to his childhood. Sure, he had some redeeming qualities, but that d I picked this book up from my local library after hearing of Mugabe's awful actions on the news. What better way to understand the man than through the words of those who know him the best? I felt that Heidi Holland wrote this from a biased viewpoint. She thoroughly believes he is not as bad a person as the media makes him out to be, and tries to explain his actions away by using the classic psychological technique of going back to his childhood. Sure, he had some redeeming qualities, but that does in no way erase the atrocious human rights abuses he ordered. Really think that this book was an attempt at psycho-analysis. The write had no close encounter with the man himself, so I find it hard to understand how she arrived at her conclusions. I was not impressed to say the least! Bit disappointed... The book is good but somewhat sluggish. expected more of history than talking of people. The book opens with a personal anecdote from the author, who remembers a meeting with Mugabe she had years before, when she was an idealistic liberal and he was a strong revolutionary leader. Perhaps it's this personal experience with Mugabe (of being duped by Mugabe, maybe?) that gives the author a real passion for the subject... she does not mince words as she recounts the failures and betrayals of Zimbabwe's leader over the years. There is an anger on the page here. Mostly, the book is an atte The book opens with a personal anecdote from the author, who remembers a meeting with Mugabe she had years before, when she was an idealistic liberal and he was a strong revolutionary leader. Perhaps it's this personal experience with Mugabe (of being duped by Mugabe, maybe?) that gives the author a real passion for the subject... she does not mince words as she recounts the failures and betrayals of Zimbabwe's leader over the years. There is an anger on the page here. Mostly, the book is an attempt to understand the pathology of a guy like Mugabe, to see what leads a man to become a terrible ruler. I recently find it interesting to compare these sorts of psychologies with America's own current autocrat, and there are similarities here. The biggest is the revenge obsession... Mugabe seems to be a man driven by spite, more interested in getting back at his perceived enemies than in actually fixing things. There's also a failure to realistically review his own actions, and the ability to twist and contradict reality sometimes several times in a single sentence to make the impression that he is never wrong and never has to apologize. Of course, it's not a perfect parallel. Mugabe is smart, and at least used to have ideals. The final thesis, I guess, is that those ideals are what made Mugabe so bad. When he couldn't live up to them, or when others refused to live up to them, he bailed on caring about anything at all. There's a cautionary tale in that, even for people who aren't leading a country. Holland grew up in Rhodesia, and has first-hand experience of almost all the people involved in the story of how Robert Mugabe progressed from an obscure freedom fighter via a renowned revolutionary and respected statesman to the corrupt control-freak that was toppled in 2017. The book was released in 2008, when he was at the peak of his power, and the country was was suffering the second worst case of hyperinflation ever encountered (much worse then the Weimar republic, and eclipsed only by the Holland grew up in Rhodesia, and has first-hand experience of almost all the people involved in the story of how Robert Mugabe progressed from an obscure freedom fighter via a renowned revolutionary and respected statesman to the corrupt control-freak that was toppled in 2017. The book was released in 2008, when he was at the peak of his power, and the country was was suffering the second worst case of hyperinflation ever encountered (much worse then the Weimar republic, and eclipsed only by the Hungarian crisis of the early 1920s). Mugabe was trained by Jesuits, and was by all accounts well educated and very clever. (He had seven degrees, and his intelligence was reputably only surpassed by his own appreciation of it.) He was, however, a very bad judge of people, and was sorely lacking in empathy. Holland traces this back to how his father abandoned the family, and how his brother died, leaving him as the one responsable for the family - and (in his opinion) everything else. He had a curious relationship with the English. On the one hand, he embodied the English Gentleman, in his immaculate suites (from Savile Row, until he was banned from the UK) and impeccable manners. But on the other he blames the former colonial power for everything that's ever gone wrong in the country. Holland tries to show the man behind the facade, and almost manages to find him. (She even got an interview with the man himself!) But even a human face cannot hide the disaster that his rule has brought to the country. Almost every conceivable indicator has hit rock bottom, and continues to fall. A very interesting read, although I do understand why some people were not impressed by this book. For me its important to hear directly from those who knew Mugabe personally, like Tekere, Vambe, Donato his brother, Mukonori and many others. Robert Mugabe is a tyrant, he is a bad guy we all know that but the book with its psychoanalysis tries to hard to paint a picture of a bad guy. Some of the times, I do not agree with the psychoanalysis. To me, it seems as if its laced with eurocentric patern A very interesting read, although I do understand why some people were not impressed by this book. For me its important to hear directly from those who knew Mugabe personally, like Tekere, Vambe, Donato his brother, Mukonori and many others. Holland does impressive work securing interviews with Mugabe himself, Ian Smith, Baron Carrington, and a host of others who played key roles in Mugabe's life or were involved in the creation and recognition of the Republic of Zimbabwe. The interviews are probing and very informative. My beef with the book is its attempt to psychoanalyze Mugabe from a remove. It's speculative and amateurish, and, imho, diminishes the book considerably. Nonetheless, a very interesting examination of a formidable per Holland does impressive work securing interviews with Mugabe himself, Ian Smith, Baron Carrington, and a host of others who played key roles in Mugabe's life or were involved in the creation and recognition of the Republic of Zimbabwe. The interviews are probing and very informative. Interesting read in terms of the history of Mugabe and of Zimbabwe, and the reader can gain insights into Mugabe's personality from various interviews however in terms of a real psychological assessment the author can only guess at the impacts of the events in Mugabe's life and what makes him tick so I feel he is even more of a mystery by the end of the book as at the beginning. Excellent psychological portrait of the man himself. The author describes key life events that led to the Mugabe we know today. A great read for anyone wanting a good intro to the political situation in Zim. I think the author had a good idea of showing a different side to Mugabe, but her biases were clear through the kind of questions she asked in her interviews and whose responses she did or did not doubt. In addition her psycho analysis was often quiet hard to follow or agree with. One of the very few accounts of Robert Mugabe that is fair. Highlights both sides of the man who ruled Zimbabwe for close to 40 years. I recommend this as the first book to pick up before any other Robert Mugabe read. Very insightful and gives a softer look at this magnanimous individual. There are lot of rubbish Robert Mugabe books but this is not one at all. Unfortunately, not very good. Could've been a magazine article instead of 250 pages. The author has an agenda and as much as she is honest about it, it felt too heavy handed. Good book,especially with the run down of the interview towards the end. Felt a bit one dimensional esp with regards to Britain's effect on Mugabe. Fascinating - took me a very long time to get through the book..just due to the writers style. No denying the content was worth reading though. In this book, Holland attempts to expose what really happened to Zimbabwe by embarking on an investigation of Mugabe as a person. Her goal is not to reveal the one main reason Mugabe went rogue or the biggest impact on him as a dictator. Further, the book is definitely not an attempt to excuse Mugabe’s behavior in any way as understanding does not equal condoning a behavior. Rather, her main purpose is to emphasize that the answer to the question “What went wrong?” is usually not a simple or a c In this book, Holland attempts to expose what really happened to Zimbabwe by embarking on an investigation of Mugabe as a person. Her goal is not to reveal the one main reason Mugabe went rogue or the biggest impact on him as a dictator. Further, the book is definitely not an attempt to excuse Mugabe’s behavior in any way as understanding does not equal condoning a behavior. Rather, her main purpose is to emphasize that the answer to the question “What went wrong?” is usually not a simple or a comfortable one. Throughout her book, Holland relies on her personal experience as well as on interviews with a variety of players, in the form of family members, politicians, religious leaders, and regular employees, to deliver the story of the freedom fighter who turned into a ruthless tyrant and highlight some of the possible influences on such a development. One warning I would voice to all those interested in reading the book is that the author assumes readers are moderately familiar with at least the basic elements of the conflict in Zimbabwe and Mugabe’s story. Events as they happened are not properly introduced and discussed in detail. However, there is a timeline in the beginning of the book that lists some of the most important events that relate to Mugabe’s life and development. No specific details are mentioned, but the events are highlighted. The story is so engaging, however, that it will spark curiosity to learn more about the particular conflict even if the reader has no detailed knowledge of Zimbabwe and Mugabe. Personally, I consider the book a valuable read and it certainly opens people’s eyes to the established reality that people are not necessarily born evil, murderers, or dictators. Heidi Holland was a South Africa–based Zimbabwean journalist and author who was involved in the journalism industry for over thirty years. She worked as a freelancer writer on such publications as The Sunday Times, The Telegraph, International Herald Tribune, The New York Times and The Guardian and has also worked on research projects for British television documentaries.